The Best $1.59 I Ever Spent! This morning we woke to the unexpected sound of thunder and rain. It's rare around here so we were so happy! loves to be washed off with a good rain shower. Just look at the zinnias that all came from one or two seed packets. The best $1.59 ever spent! So a couple of days ago, I bought 5 more packs of them and scattered them about. They are about an inch tall now. I can't wait for them to grow big and tall. I'm just taken with them. Happy July 4th to all of you. We plan to enjoy good food, homemade ice cream and fireworks. Oh we would love some rain too. Your flowers are fabulous and I can't wait to see even more of them. So pretty. Happy 4th!!! I love to hear about plants that are easy to grow from seed! We had a thunderstorm last night, too! I loved listening to the rain...the lightening and thunder, not so much! ;) We planted zinnias from seeds, too. Still waiting for the blooms. Yours are lovey, Stacey! Happy 4th! As I type this the wind is picking up and the thunder is rolling. But that is summertime where I live in North Central Florida. I luv it! Beautiful zinnias. I might have to get some in the garden. Your zinnias are stunning. I am going to have to get me some seeds and throw them in he garden. I would dance in the garden in my night gown if we would get some rain, but I am afraid that it won't happen until November. Hey, Stacy! YOur zinnias look amazing. I planted some last year, but didn't this year. I was thrilled to see some volunteers this year, and I managed to cut a few before the Japanese beetles started munching on them. Grrr. Seriously? 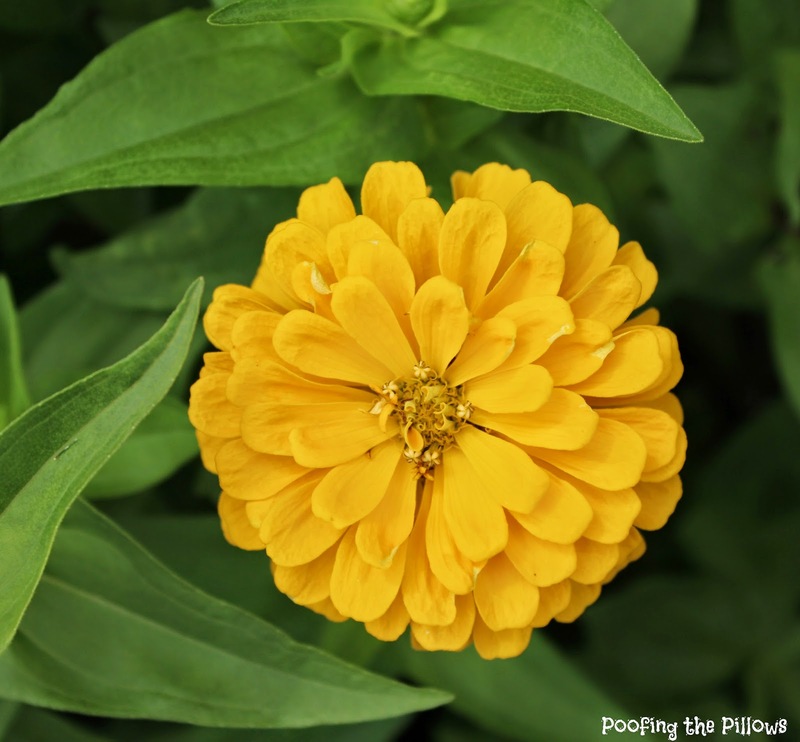 I'm buying some zinnia seeds when I go to Lowe's tonight, Stacey! : ) They look great and it sounds like they grow fast. I could use them to fill in some spots around our condo. 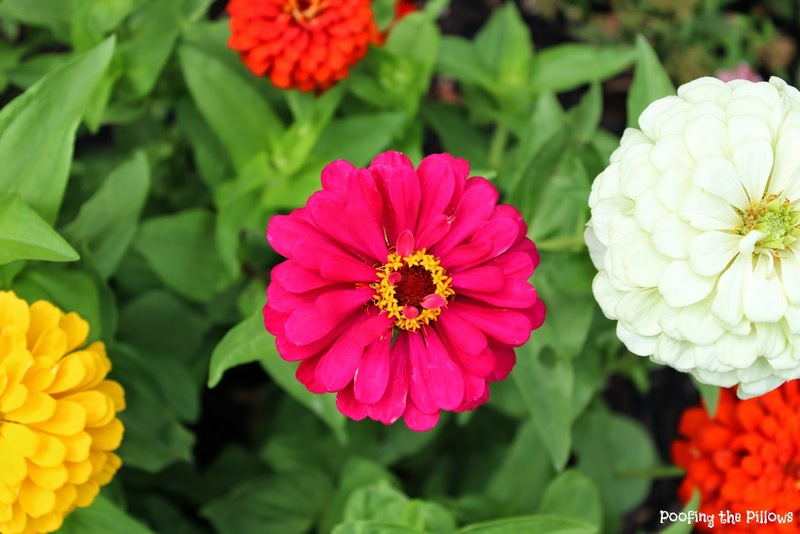 Beautiful photos of your zinnias. For some reason they don't seem to grow well in my ground. I envy all your beautiful blooms. Glad you got some rain. I know what a blessing it is when you desperately need it. Zinnias are one of my favorite flowers! I like to save the dried flower seeds and sprinkle them in the ground the next year. That makes them even cheaper! zinnias are the best! Have a wonderful holiday weekend! Those Zinnias are beautiful, and what a wonderful pop of color! Most of our flowers are gone now, eaten by the grasshoppers we can't seem to gain control over. 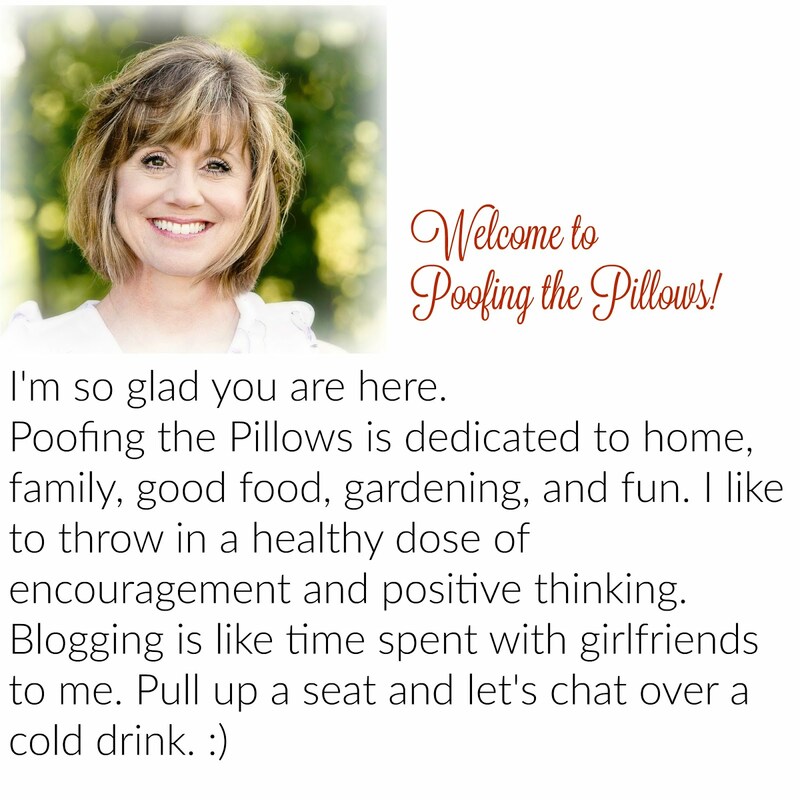 "Poofing the Pillows" has been included in our Arlynda Lea's Sites to See #7. We hope this helps to call more attention to your efforts. Your zinnias are beautifully bold and bright in that gorgeous sunshine! We bought two small plants a few weeks ago. One died almost a few days later, while the other, although very pretty, is struggling to stay alive, due to horrible wind storms and excessive heat. You have inspired me to buy some seeds and scatter them throughout my garden for next year! When should this be done? Thanks for brightening my blustery day! So pretty! I'm definitely going to grab a couple of pks next time I'm at the store! Stacey, your zinnias are so pretty! I haven't tried them yet. After seeing this post, I may try them next year. We loved seeing all of the rain that we got, as well! I just enjoyed sitting out and enjoying the 'cooler' temps. It was nice. Your zinnias are so vibrant and pretty! Zinnias are such happy little flowers! In response to your comment, It means that some things never change! Oh, and I LOVE your zinnias. I'm going to go get me some seeds and sow them, too. I've never grown a flower from seed in my life - I'll definitely be trying this - thanks so much for sharing - I can't get over how fast they grow - and they are one of my favorite flowers!!! 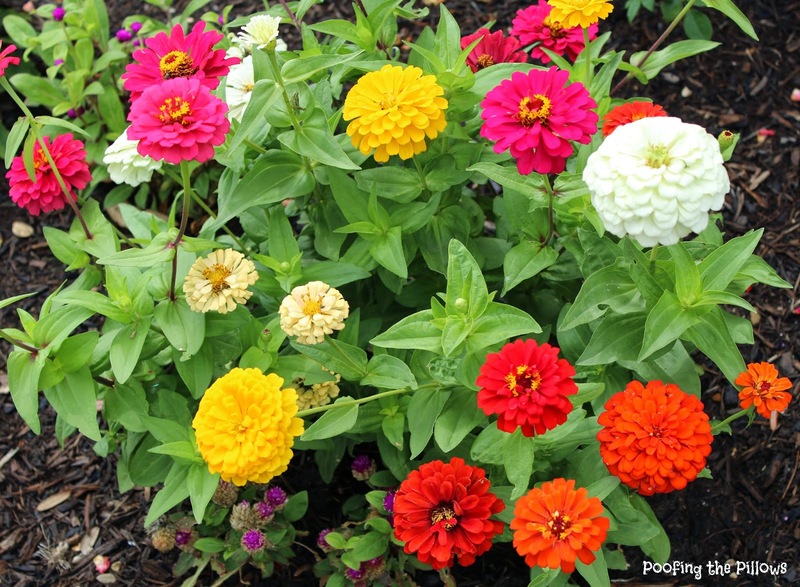 Wow...what a great garden of zinnias ... love them .. so did you just scatter the seeds or plant them? I love Zinnias. They are my favorite. I just take the seeds and throw them out and they come up although I did not get that done this year. Yours are beautiful. Oh, your zinnias are beuitful. They are one of my favorites. I planted some by my front fence, just to find that some creature decided to have them for breakfast. I also have some coming up in my vegetable garden, so maybe I'll have flowers for my kitchen window soon. Thanks for the tour, your garden is glorious and it's nice to meet you. So beautiful!!! We received a little rain here too and everything perked right up which is nice for a change. Just gorgeous... I may have to look for some myself. I bought and planted some zinnia seeds as well this summer. My mistake is that I contained them in a pot. I should have just planted them in my gardens. I love the multi colors and they make the greatest fresh cut flowers for the house. Last quite a while!! I love zinnias! And you grew them from seeds? I really need to try, and I agree….you got mucho bang for your buck! 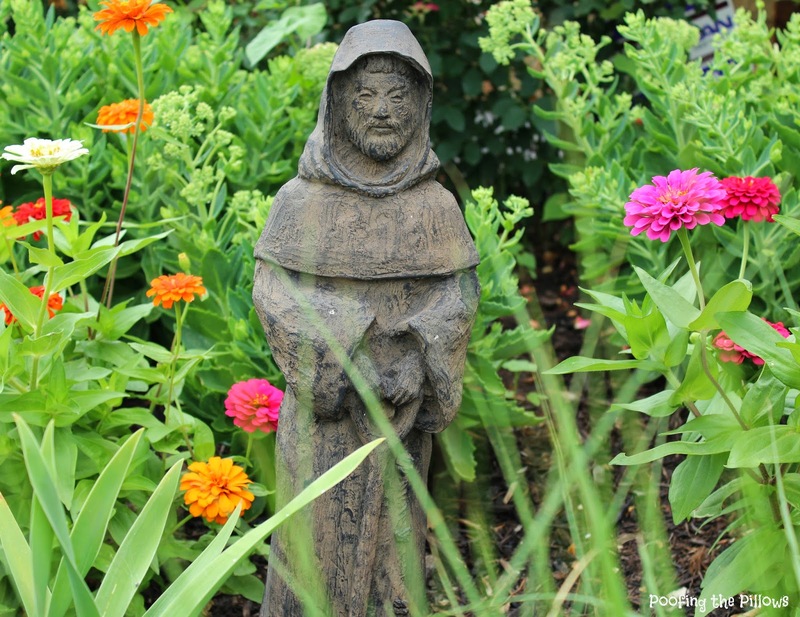 Zinnias are my most favorite flowers...yours are beautiful and make me want to plant more! Thanks so much for stopping by! great, they look so very bretty! You do have a very talented hand for gardening! Love your zinnias. So glad they came up so nicely. Wish I had sun so I could plant zinnias too. Wow, I love these. This happened once when the kids gave me one of those Mother's Day packets with seeds. I was not thinking much but then woke up to a vine of beautiful Morning Glories. Zinnias are such a pretty easy to grow , pretty flower. And they always seem to come back! Your zinnias are gorgeous. I love them. I plant them most every year. Last year was the only disappointing year...we'd had so much rain that hardly any came up; I think the seeds washed away or something. Nothing that thrives in hot dry weather did well that time / this year's going to be better I hope. So jealous! They are gorgeous. Need to purchase some seeds ASAP!